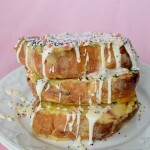 Sure I’ve done tons of funfetti recipes before & even tons of layered cake recipes, but this one is certainly unique. 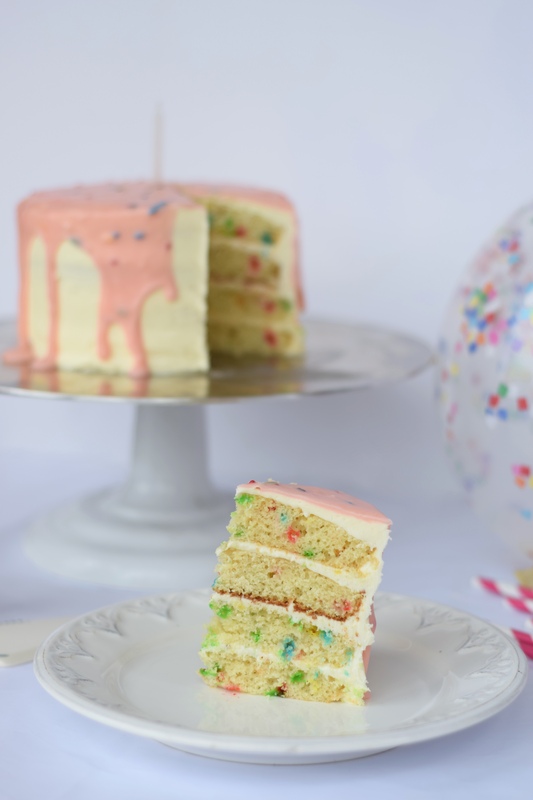 Topped with a cake batter ganache, this is the ultimate funfetti cake recipe. Speaking of that ganache, if you scour the internet as I do, you’ll notice the only types of ganache recipes out there are for dark, milk, & white chocolate ganache–maybe raspberry or vanilla if you really search for them. While that’s great & all, it just didn’t seem right on a funfetti cake. 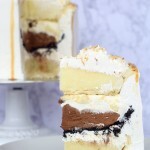 On a banana & nutella layered cake? Duh but a funfetti cake, not so much. So I present to you: the ORIGINAL cake batter ganache recipe by yours truly. 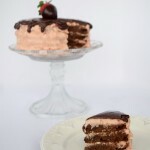 This decadent layered cake is sure to be an instant classic. I’m talking layers of funfetti cake held together by creamy vanilla frosting & topped with that cake batter ganache we were talkin’ about. I don’t know about you but I’m drooling just writing this. So what are you waiting for? 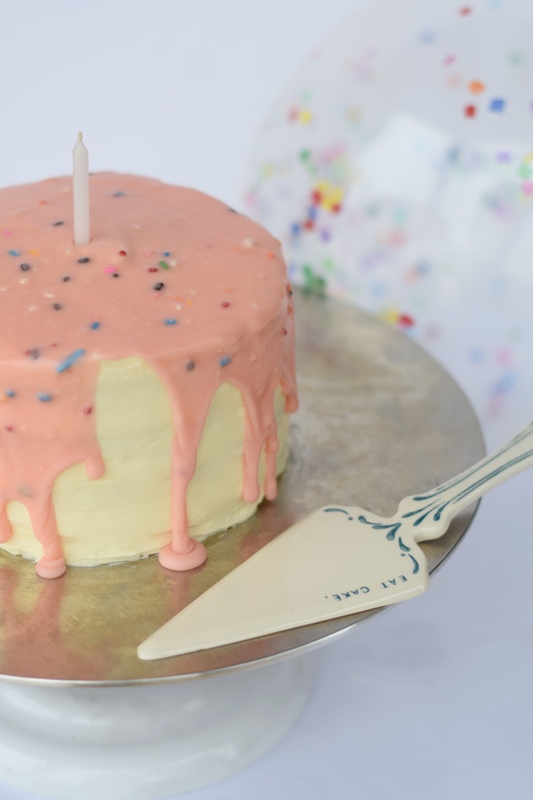 Make it for a friend’s birthday or as a fun hump day treat. Made it halfway through the week? You totally deserve this, so treat yo’self! 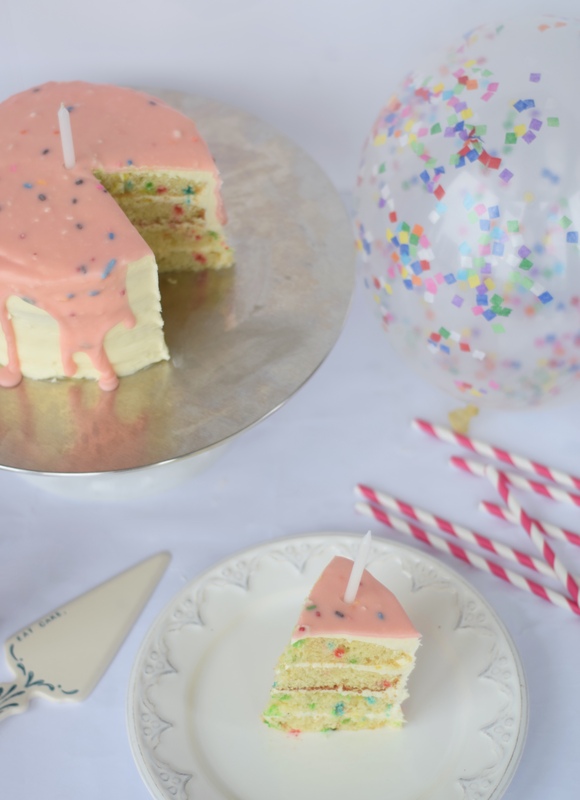 Seriously, this cake is a guaranteed hit, and will have everyone thinking you’re a cake master (no one has to know that it’s actually super easy to make). sprinkles & tons of them! 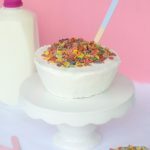 In large mixing bowl, combine all cupcake ingredients. Stir to combine. Spray layered cake pans with baking spray. Fill with even amounts of the cake mixture. Preheat oven to 345 F. Bake cakes 12-16 minutes or until toothpick is inserted & comes out clean. In separate mixing bowl, combine all frosting ingredients. Stir to combine. Place first layer of cake on cake stand. Using the offset spatula, layer frosting on top & then place another cake on top of the frosting. Repeat until all cakes have been used. Place cake in fridge for roughly 2 hours. In small mixing bowl, place heavy cream. Microwave whipping cream for 2 minutes. Add in chocolate immediately & stir. Slowly, sift in the cake mix. Immediately pour over cake. Serve & enjoy! This cake looks delicious! Sounds do-able too! Thanks for the recipe! 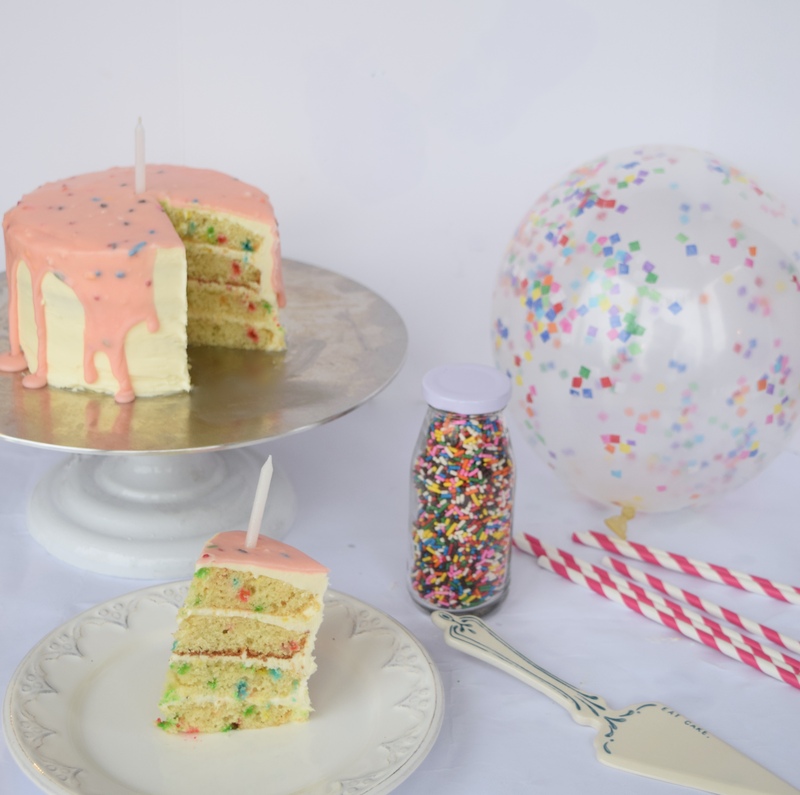 You cannot beat funfetti but you’ve totally taken it up a notch. This looks amazing! This is too adorable! I need to try making this for my little gilr, she would love it! Oh my goodness! This cake looks devine! I would love, love, love to eat a slice right now. 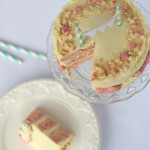 It looks so girly, pretty, and aboslutely delicious! 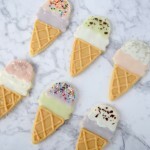 I need to make this for dessert the next time I have a dinner party!